this second image (the small one) is the coolest picture I’ve seen in a long time…only because of the sentiment it holds. My brother took this TODAY (out his car window— sorry for the picture quality) while out clocking his mileage for his latest run in Maryville. This is our old landcruiser that we sold for next to nothing years ago (with over 250k miles on it). Dad said the guy who bought it was going to “fix it up”…and…well, apparently he did!! We didn’t know the guy or where he lived or anything about where the car was headed…which made its re-discovery an awesome surprise! 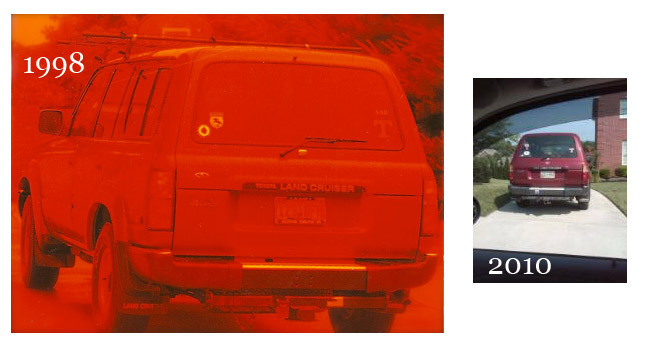 Same stickers (jeff updated them when he got the car so they’re a smidge different from the 1998 pic), same dents…same character…new drivers. We have a lot of memories from riding around in this old car (its a 1991!!). Many of my highschool and college memories involve it…as I’m sure is the same with Jeff’s (my brother). What I love the most about this picture is that this is IT. Its not a replica. Its not just a picture of what it looked like…this is IT. Years later…the landcruiser still lives!! What sparks YOUR fondest memories? That is not just a little great… that is REALLY great! I, too, have fond memories of Byron Now, if we could just find the SKATE! ah, the skate…. oh how I miss it!! !